folks have a misguided perception that these old dogs are just waiting to pass. That couldn’t be further from the truth! 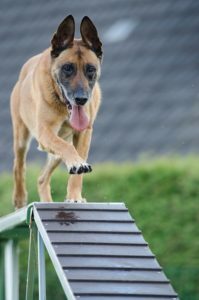 With a healthy diet and, the right, exercise, an old dog will be set up to bring joy to their adopters for years to come. Covering both facets of health, diet, and exercise, is too much for a single blog post, so we are going to be focusing solely on the exercise aspect! The first thing that we need to figure out is what the ideal weight is for our senior dog. Unfortunately, mainstream body condition score has been shown to be way too subjective for us to recommend using it. 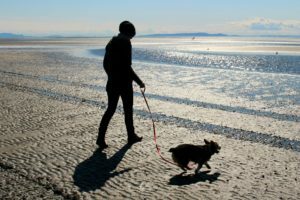 Fortunately, because of that fact, we hit the books, found a study that tested an objective, measurement-based, accurate method, and converted it into an easy-to-use calculator for establishing the “perfect” weight for our dog. The calculator can be found *here. What exercises are “right” for seniors? The short answer is low-impact, low-impact, and low-impact. To illustrate what we mean, I’ve compiled a list of my top five exercises for old dogs below. 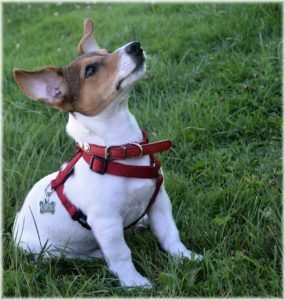 Every dog is different, so before trying any of our suggestions, make sure you speak with a veterinary professional about your dog’s limitations and any exercises you should avoid or focus on. healthy, scientists have repeatedly shown that the benefits of that walk for you are though the roof as well! In a perfect world, I would suggest multiple short walks throughout the day, but if, for whatever reason, that isn’t possible, the suggestion above will be a great starting point. One point of caution, pay attention to your dog. If she starts to struggle or show signs of discomfort, cut your walk short and dial back the distance on the next one. commands also has the side-effect of being able to control your pup’s behavior when needed, which is a wonderful thing. For an old dog, we recommend indoor fetch with his favorite toy. A toss across the room, every now and again, keeps the blood flowing and our sweet pup’s metabolism guessing. Both lead to a fit, healthy body composition. This is just as entertaining as it is good for your senior dog. The idea is simple. You hide a few treats around the house when your dog is in a stay(in another room, where he can’t see you). When you’re finished, tell him to come in and find the treats! This is also really good for our pup’s mental health. Keeping him from getting bored or lethargic in his golden years. 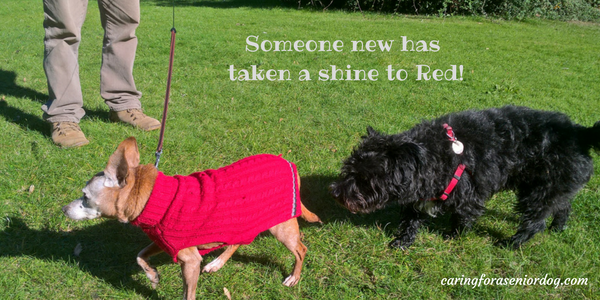 Old dogs have so much life left and so much more to give their adoptive humans. Sometimes we have a notion of older dogs being frail or “on death’s door”. This couldn’t be further from the truth. A senior dog can provide so much love and affection that most puppies would be jealous! Combined with some, or all, of the suggestions above, your senior dog will bring joy into your life for many, many seasons to come! We’d love to hear from you. 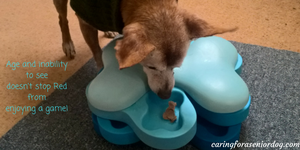 Do you do any, or all, of these 5 exercises to keep your old dog feeling young? *Whenever you start a new exercise program for your dog, it is important to first discuss it with your veterinarian. 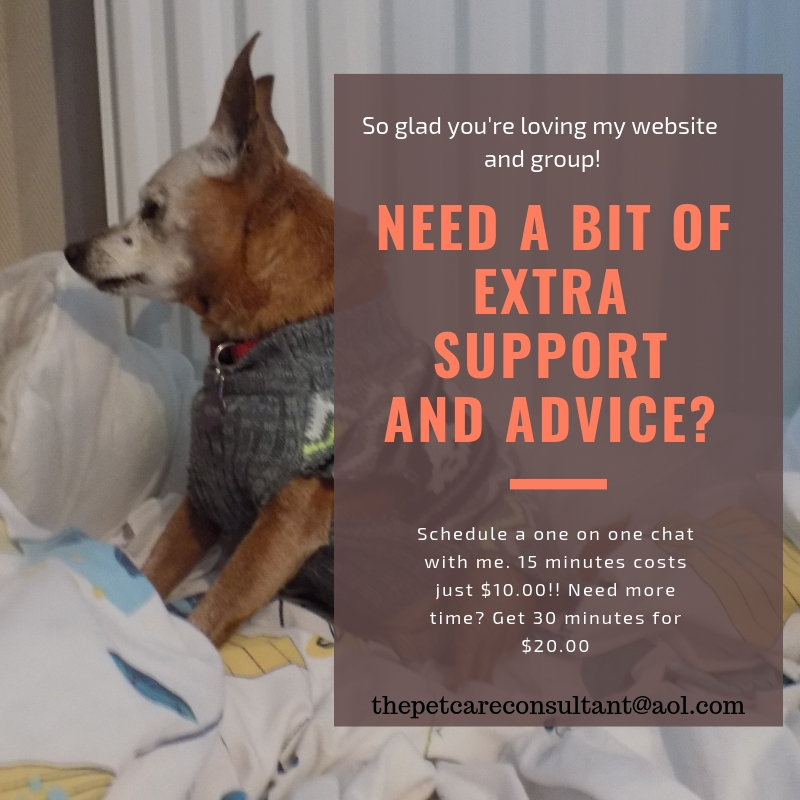 This post was kindly written by Paul Kirhagis, owner/operator at 4dogsandalittlelady.com, a website dedicated to educating and entertaining readers on life with foster dogs. They focus on their own crew of four dogs, as well as, the constant stream of fosters that come through their doors. You can connect with Paul on Facebook, Twitter and Instagram.